It became the most famous broken promise in modern political history. George H.W. Bush made it inside the New Orleans Superdome on Aug. 18, 1988. He was there to accept the Republican presidential nomination and to launch his fall campaign against Democrat Michael Dukakis. "My opponent won't rule out raising taxes, but I will," Bush said. "And the Congress will push me to raise taxes, and I'll say, 'No.' And they'll push, and I'll say, 'No.' And they'll push again, and I'll say to them, 'Read my lips: No new taxes!'" By channeling Dirty Harry, Bush hoped to put to rest once and for all two of the biggest doubts about his candidacy. From the right, there remained deep skepticism about his commitment to the conservative cause; among the public at large, there remained a stubborn image problem — "the wimp factor," as a Newsweek cover had memorably put it a few months earlier. In the short term, it succeeded brilliantly. The no-taxes line brought down the house in New Orleans and the Bush team went to work reducing Dukakis to a caricature of liberal feebleness (with, Democrats grumbled, able assistance from Dukakis himself). In November, Bush carried 40 states and 426 electoral votes — coast-to-coast dominance that no Republican nominee since has come close to. But two years later, President Bush found himself in a budgetary jam. The boom economy of the Reagan years was slowing, interest rates were climbing and annual deficits, already up drastically over the last decade, were exploding. Just as Bush had predicted in his speech, Congress, with its big Democratic majorities, pressed him to raise taxes. But there was no climactic stare-down. Instead, Bush said he'd go along with the demand. It kicked off what was known as the budget summit, months of negotiations between the White House and congressional leaders from both parties. This was the way, generally speaking, of Bush's generation of leaders, compromise over confrontation. The grand bargain was announced in the Rose Garden on the last of September 1990: Democrats would get hikes in the gas tax and other excise taxes and Republicans would get spending cuts, including a chunk from Medicare — a big, bipartisan deal that would, supposedly, slash deficits and steady the economy. "Sometimes," Bush said, "you don't get it just the way you want, and this is such a time for me, and I expect it's such a time for everybody standing here." The top-ranking Republicans on Capitol Hill, Senate Minority Leader Bob Dole and House Minority Leader Robert Michel, stood with Bush at the ceremony. But there were others in the GOP, more than Bush had ever realized, who saw this as a betrayal by the president — not just of his own promise but of everything their party had come to stand for. The Republican Party of the old days had prioritized balancing the budget, even if it meant higher taxes, but Ronald Reagan's revolution had upended all of that. In his 1980 campaign, Reagan embraced the newly popular concept of supply-side economics, which claimed that tax cuts, by unleashing economic growth, could actually produce more government revenue. The idea was ridiculed as "voodoo economics" by Reagan's chief opponent in the '80 GOP race, a moderate named George Bush, whose strong showing in the primaries landed him the VP slot on Reagan's ticket. Bush spent the next eight years refashioning himself as a Reagan loyalist and making peace with the ascendant conservative wing, but the right remained on guard — hence the "Read my lips!" pledge. By breaking that promise, Bush was validating all of those old suspicions. In a different era, this might not have mattered, with the combined force of the White House, Dole and Michel prevailing on GOP members to fall into line. But by 1990, there was an equalizing force: Newt Gingrich, who'd recently claimed the No. 2 slot in the House GOP leadership. To Gingrich, taxes were central when it came to differentiating Republicans from Democrats — a "conservative opportunity society" vs. a "liberal welfare state" was the choice Gingrich wanted Americans to see between the parties. The next thing Bush knew, a full-scale revolt broke out, and when the House voted in the wee hours of Oct. 5, a majority of Republicans sided with Gingrich and broke with their own president. The deal died, and the final tally wasn't even close. The blow was humiliating for Bush, who then cut a new deal, this time slanted even more heavily to Democrats' demands. Finally, with Gingrich and much of the GOP still up in arms, the package passed and Bush signed it. It was a turning point in many ways. 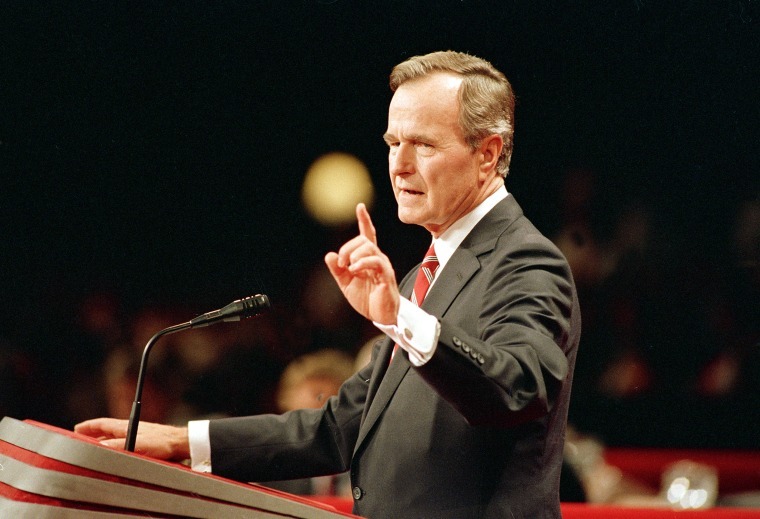 For Bush, it helped to fuel a primary challenge in 1992 from Pat Buchanan, who shocked the political world with a strong showing in New Hampshire. Alarmed, Bush then tried to renounce his own tax hike. "Listen, if I had it to do over, I wouldn't do it again for a lot of reasons, including political reasons," he said. Bush survived the Buchanan challenge, but when he sought to paint his general election opponent, Bill Clinton, as just another tax-and-spend liberal, the rebuttal practically wrote itself. "He is the person who raised taxes on the middle class after saying he wouldn't," Clinton said. Bush's calculation had been that the deal would stabilize the economy, thereby helping him win re-election. But the recovery from the early '90s recession was slow, with unemployment peaking just months before Election Day in '92. "It's the economy, stupid" famously became the Clinton campaign's mantra, and when Bush was drummed out, even Republicans who had stood with him on the tax deal grew convinced that it hadn't just been bad politics but bad policy as well. In GOP circles, Bush's political demise played as a validation of Gingrich's approach. When Clinton sought his own tax hike to tame the deficit in 1993, there was no bipartisan deal. Every single Republican in the House and Senate voted against, with the White House only getting its way with a tie-breaking Senate vote from Vice President Al Gore. Republicans accused Clinton of enacting the largest tax increase in history and in 1994 reaped an electoral bounty that made Gingrich the speaker of the House. Uniform opposition to tax increases has been a staple of the congressional GOP ever since. Ironically, as the economy blossomed in the mid-'90s, the higher tax rates from 1990 and 1993 helped bring in a revenue windfall. By 1998, the country even ran a surplus for the first time in decades, and the elimination of the national debt actually seemed in sight, but the explosion of spending after 9/11 changed that trajectory. In 2014, as Bush neared 90, the John F. Kennedy Library gave him a Profile in Courage Award for "putting country above party and political prospects" when he raised taxes. Bush accepted and thanked the library "for remembering what our team tried to do, lo, those many years ago." He wouldn't say it, but it seemed he no longer thought he'd made a mistake — even if it had become an article of faith within his party that he had.